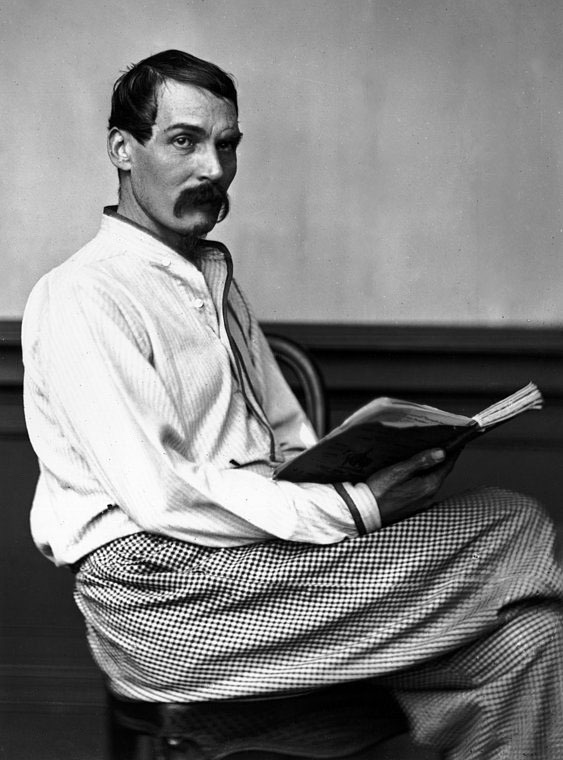 To call Sir Richard Francis Burton an adventurer is, really, a huge oversimplification. He was an explorer, a translator, a linguist, an ethnographer, a diplomat, a spy, a poet and a soldier – one of the most eccentric, fascinating and controversial of Victorians. He’s buried in an otherwise unassuming churchyard in Mortlake, South West London, in a stunning mausoleum that captures something of the dramatic, adventurous nature of his life. 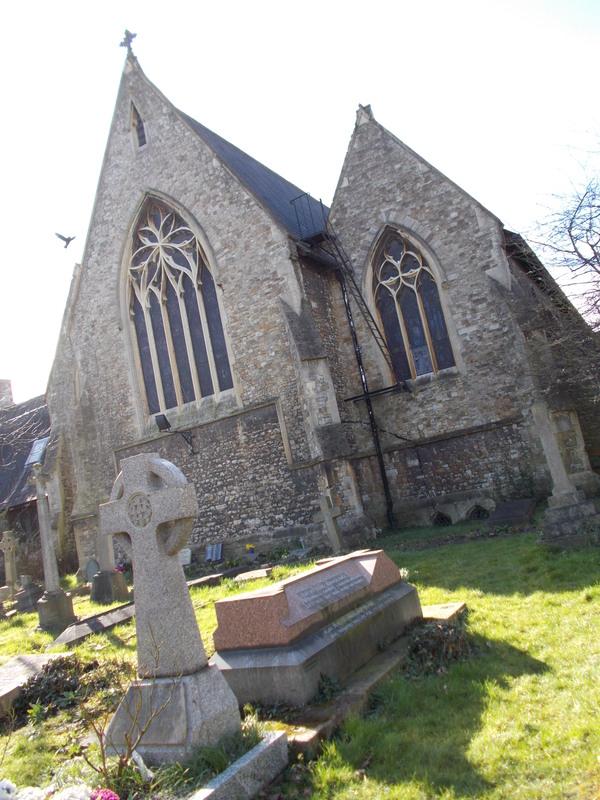 The churchyard of St Mary Magdalen in Mortlake sits behind a high wall, sandwiched between the church and its associated school. I visited on a bright sunny afternoon in early spring, when the bitterness had gone out of the wind and the first daffodils were beginning to show their cheerful faces. It’s a cluttered little churchyard with a wide variety of graves – grand tombstones, war graves, even some white marble memorials to a number of nuns. But Richard Burton’s eccentric tomb draws the eye almost immediately. Richard Burton was born in 1821, and from a young age showed a prodigious gift with languages, learning French, Italian, Neapolitan and Latin when he was a boy. After being expelled from university for violating college rules, he joined the army of the East India Company. While in India he was able to learn more languages, though his interest in local culture caused him to be shunned by many of his fellow soldiers. It was during his time in India that he first started travelling in disguise. This penchant for disguise allowed Burton to join Muslims from the Sindh on the Hajj pilgrimage to Mecca, making him one of the few non-Muslim Europeans to make such a journey. 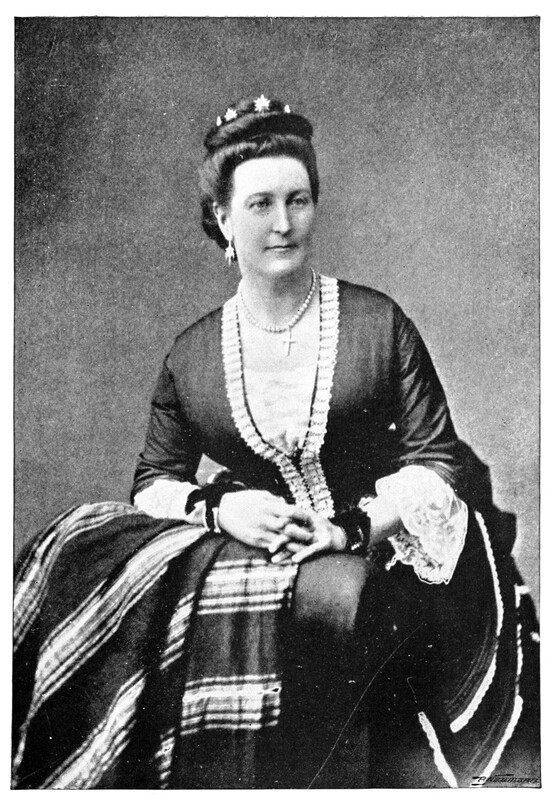 Burton also went on many expeditions, some funded by the Royal Geographical Society, and was the first European to discover Lake Tanganyika in East Africa. He was also posted to Africa on diplomatic duty, serving as a consul in what is now Equatorial Guinea. His diplomatic service also took him to Brazil and Damascus, and to the Austro-Hungarian Empire (where he was posted after making a lot of enemies in Damascus – Burton sounds as though he wasn’t the easiest of people to get on with). 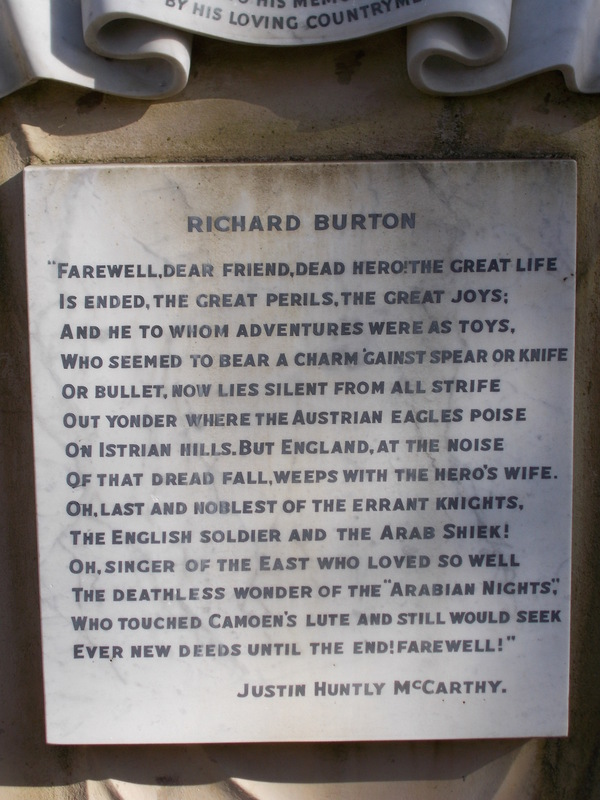 It’s believed that by the time of his death, Burton could speak over 25 different languages. Burton’s writing caused a great deal of controversy during his lifetime – his translations of the Kama Sutra and and the Arabian Nights were considered pornographic at the time of their publication, and his willingness to write frankly about sexuality and sexual practices caused him to be viewed with suspicion. When Burton died of a heart attack in 1890, his wife Isabel designed the remarkable tomb that they both now rest in. The tomb takes the form of a Bedouin tent, its stone skilfully carved to resemble fabric. 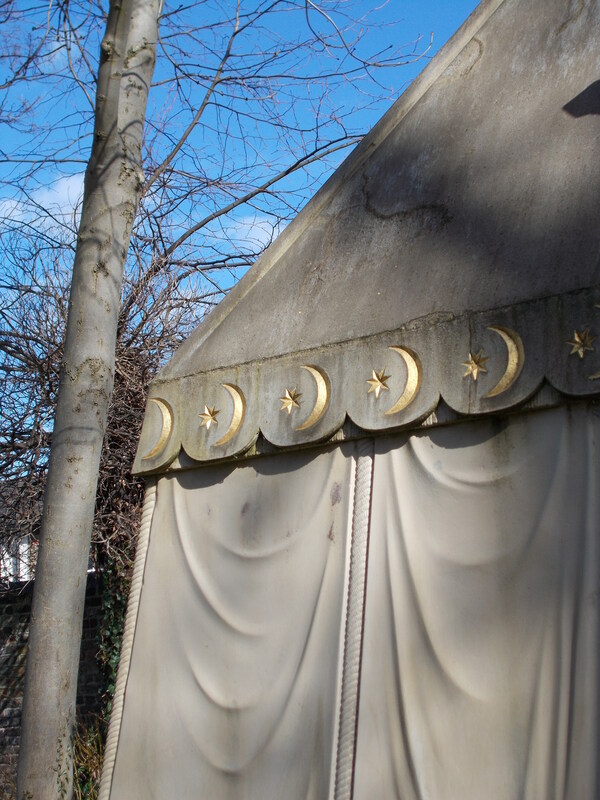 The tomb is decorated with gold stars and crescents, symbols that are more readily associated with the Islamic world and therefore rather an unusual sight in a little Catholic churchyard, but given Burton’s fascination with the Middle East they seem quite appropriate. 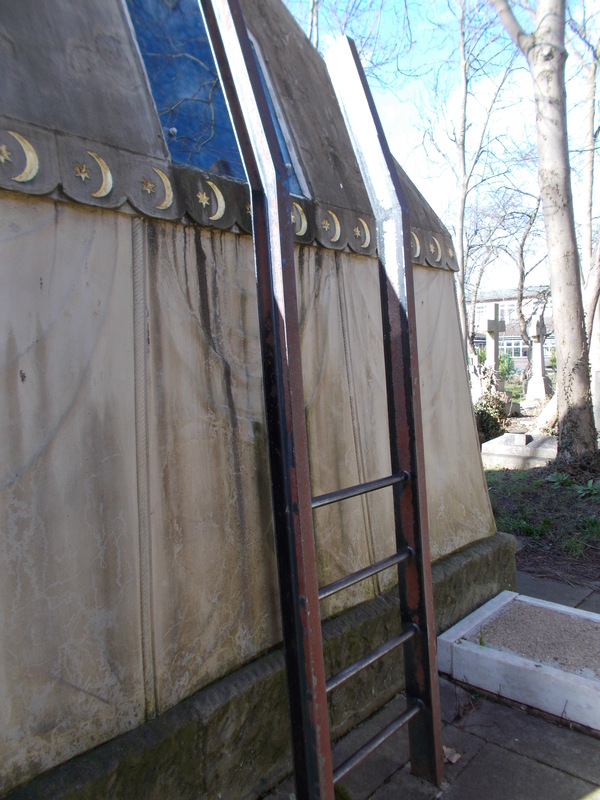 If you walk round the back of the mausoleum, you will find the most unusual of its features – a ladder, and a glass panel. Yes, the mausoleum was designed so that the visitor can climb up the ladder and have a peep inside. Well, I certainly couldn’t resist a prospect like that and carefully climbed the ladder, momentarily glad that my expensive, delicate camera was safely at the repair centre rather than risking getting bashed against the ladder as I climbed. It was pretty hard to see inside at first, as it was so bright outside, and actually the pictures I took captured more of the mausoleum’s interor than I could see myself. Two coffins lie inside, Isabel’s on the left and her husband’s on the right. Camel bells, collected during Burton’s travels, hang from the ceiling. 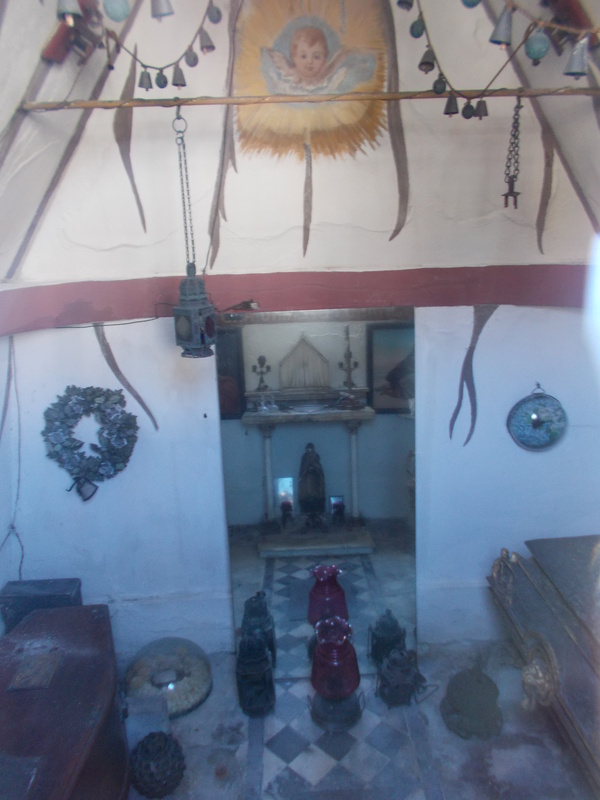 A mirror helpfully shows the viewer the little altar at the back of the mausoleum. The statue, possibly of Jesus or one of the saints, may be one of Isabel’s additions – she was a lifelong Catholic, whereas her husband was brought up Anglican but considered himself an atheist. The contents of the mausolem mainly appear to be artefacts that Burton collected during his life – perhaps they were items that were particularly precious to him. Grave goods of a sort, perhaps? I couldn’t help but wonder if the wreath above Isabel’s coffin has been there since her burial in 1896. The fact that the interior has survived at all is miraculous – so many mauseolea built during the Victorian period have suffered horribly at the hands of vandals. On a recent visit to Kensal Green, I nocticed that many of the mauseolea there had their entrances unceremoniously blocked up by modern bricks or concrete to prevent any further vandalism. I suspect that the Burton Mausoleum has suffered less because the churchyard it resides in is surrounded by a high wall, and its entrance gate is secured at night. It was restored in 1975, and again in 2012-2013 – this more recent restoration was funded by the Environment Trust and the Friends of Burton, and won an award from English Heritage. The Burton Mausoleum must be the most unique grave site I’ve visited so far – its eccentric design, and the thoughtful addition of the window at the back of the mausoleum gives visitors a rare glimpse into the space where the coffins were laid to rest. A fitting memorial to a clever, complicated and controversial man. 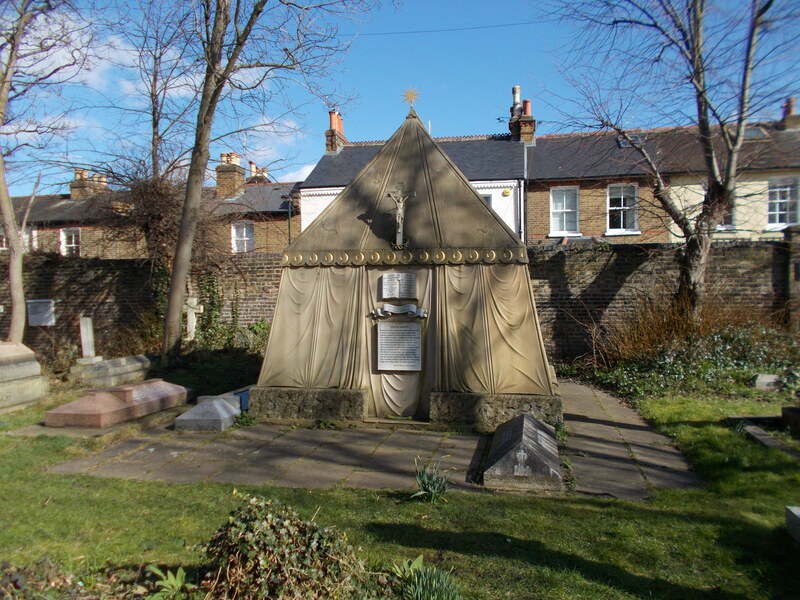 The Burton Mauseoluem can be found in the churchyard of St Mary Magdalen Roman Catholic Church, 61 North Worple Way, Mortlake SW14 8PR. The burial ground is usually open during daylight hours. As this is my first blog post for Cemetery Club, I suppose it’s the done thing to introduce myself. I’m Caroline, originally from Lancashire but now happily settled in London. I currently work in the education sector, and I’m hoping to return to university later this year to pursue a doctorate in History. 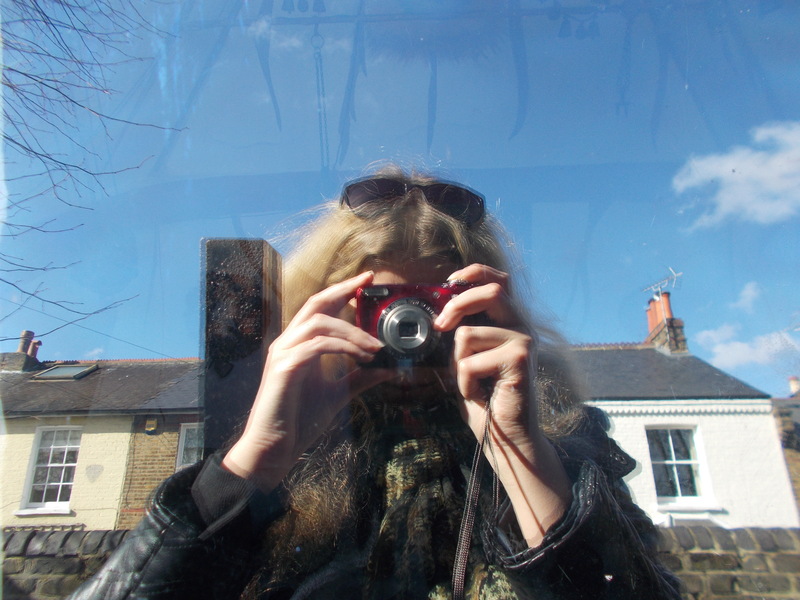 I write the Flickering Lamps blog, which explores the history of places – churches, ruins, shrines, parks and (of course) graveyards – the latter being what put me on Sheldon’s radar. 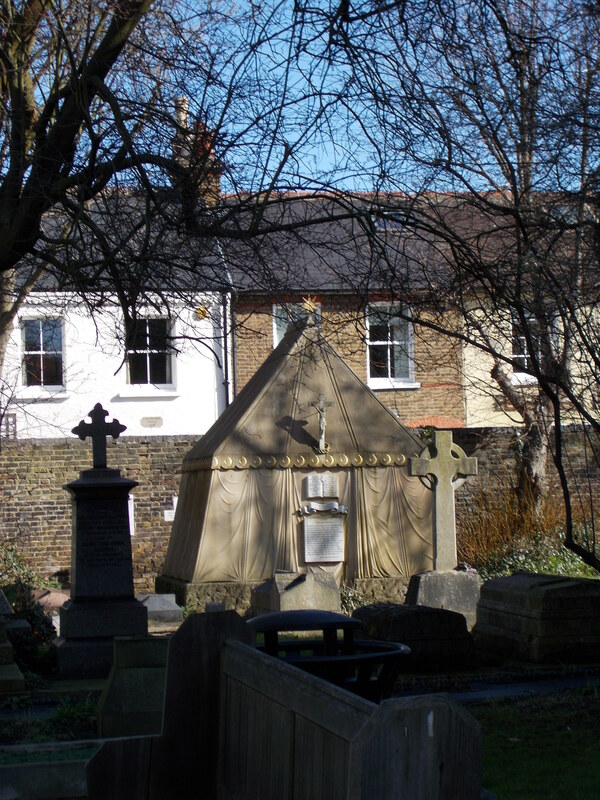 I’m delighted to accept his invitation to be a part of Cemetery Club and I’m looking forward to sharing more of my adventures in churchyards and burial grounds in London and further afield. As luck would have it, the beginning of my time with Cemetery Club has coincided with my usually trusty Olympus PEN camera being in the repair shop getting its lens fixed and cleaned, so for this post I’ve had to use my rather crummy backup camera. Luckily I think I’ve still been able to capture the fantastic eccentricity of Richard Burton’s tomb and hopefully by the time I write another post, I’ll have my good camera back! Pingback: 20 October | Drink wine today because …. I happened to wander into this graveyard in 1982 while visiting London. I sat for an hour remembering the books I had read of Sir Richard Burton’s explorations as a child . Remarkable that I stumbled onto the tomb of one of the heros of my youth.I was touched then and am still.Thank you for the memories! Really enjoyed seeing and learning more about Burton’s mausoleum. After all, this was the most fabulous and fascinating man in all history.